The Secular Coalition for America today announced a matching gift challenge of up to $500,000 from philanthropists Jeff Hawkins and Janet Strauss. Jeff is the mobile computing entrepreneur who invented the PalmPilot and the Treo, and is now known for his work in brain theory at Numenta Inc., a company he co-founded in 2005. “This challenge grant from Janet and Jeff will spark innovation in our movement, empowering Secular Coalition for America to vigorously execute “Our Secular Decade” strategic plan. We intend to create a secular coalition affiliate in every state, each advocating for the secular government as the Father of the Constitution, James Madison, intended,” said Sean Faircloth, executive director of the Secular Coalition for America. Go to http://donate.secular.org or contact Caroline Slobodzian, development manager, to donate a Society gift of $10,000 or more. For each new (or upgraded) Society gift to Secular Coalition for America, Jeff and Janet will match dollar for dollar to the Secular Coalition for America Education Fund. Those who already participate at the Secular Society level can upgrade to a higher Society and their gift will be matched as well. According to a new survey, conducted over the internet, Christians in Europe are more likely than Christians in other parts of the world to accept evolution. What’s more, Christians the world over were much more likely than atheists to say that they were absolutely certain in their beliefs about evolution and how the universe came to be. The survey was run by David Wilson at the University of Newcastle in Australia. Over 4,300 people took part, recruited basically by word of mouth as well as some adverts. The survey was very quick – just one question about acceptance of evolution, then a few questions on faith and why they hold the beliefs they do. The figure summarizes the key findings (you’ll need to click on it for a larger version). Basically, the bar charts show how the percentage of different groups who say they are absolutely certain of their beliefs in evolution (atheist, black; Christian, red; agnostic, cyan; other, grey). 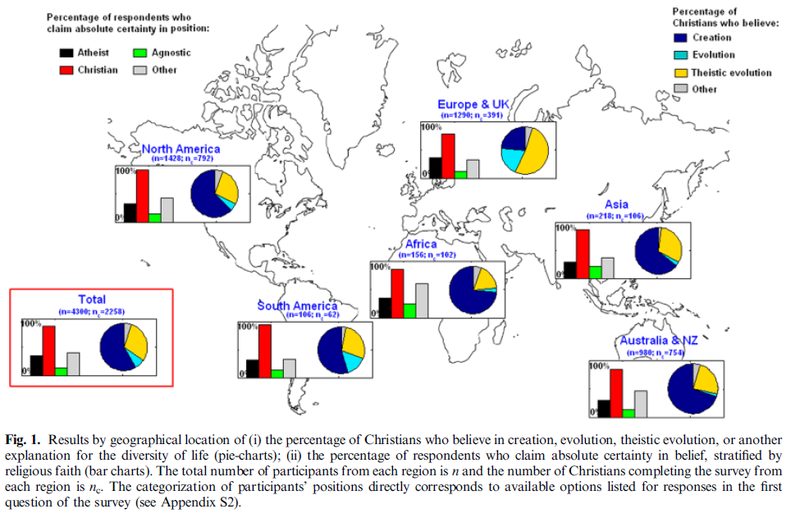 The pie charts show the beliefs of Christians – dark blue is creationist, light blue evolution, and yellow is “theistic” evolution. Most Christians surveyed were creationist – except in Europe. 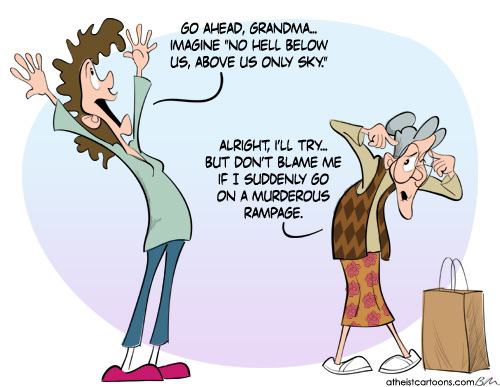 Although Christians there were just as convinced of the correctness of their beliefs! Wilson reckons that European Christians might be educated differently, or have a different cultural background. He also suggests that European Institutions which have come out firmly against creationism, like the Council of Europe and the European Parliament, may have had some influence. I dunno. Looking at the survey, it picked up loads more atheists in Europe. Maybe the survey just circulated in different circles in Europe. Anyway, another interesting finding of this survey is that it asked Christians why they didn’t believe in evolution. The most popular reason was the Genesis should be interpreted literally. The next was that it undermines the belief that humans were created in God’s image. Only then, in third and fourth place do we get to the two ‘evidence-based options’ – that there is no evidence of evolution of one species into another (50% of responses) and there is no evidence for natural selection (40%). So the primary objection these Christians had to evolution is not evidential, but dogmatic. In contrast, when atheists were asked why they didn’t believe in God, their overwhelming response (given by 85%) was that there is no evidence! Do people reject evolution because it unnerves them?